A walk along the south bank of the Thames is an excellent way for time-pressed tourists to have a whirlwind tour of London's most famous landmarks, historic buildings, sculptures, tourist attractions and street performers. 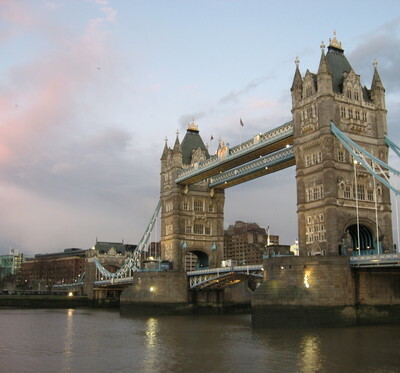 The walk described in this article extends from Westminster Bridge to Tower Bridge. It is a bit longer than most of the walks provided in official city walking guides, but it has the benefit of capturing more of the sights of London for visitors who want to 'see it all' and it is a great way for locals to spend time enjoying the outdoors without leaving the city. For shorter walks visit 'Walk this Way', which provides 5 distinct walking guides for the south bank. London skyline after a thunderstorm. Photo by Erin Connelly. The length of the walk is approximately 2.5 miles (4 km). At a leisurely pace, it may take over 3 hours to complete the walk. There are also numerous cafes and restaurants along the south bank. Westminster Bridge is a good place to begin the walk as it is easily accessible by tube and provides great views of Parliament, Big Ben and Westminster Abbey. Westminster station, located at the corner of Bridge Street and Victoria Embankment, is the closest tube stop. From Parliament Square cross Westminster Bridge to the south bank and begin walking East toward Tower Bridge. Parliament from Westminster Bridge. Photo by Erin Connelly. 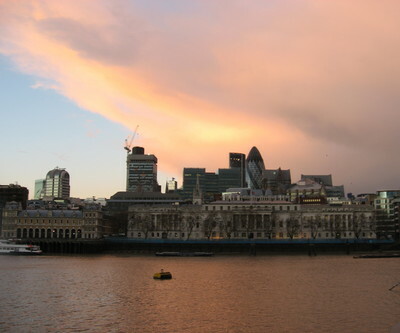 Apart from the city skyline and the Thames, the main sights along the south bank include: London Dungeons, Millennium Bridge, London Bridge, Tate Modern, Southwark Cathedral and the Gherkin Building. Mime pretending to be a statue. Photo by Erin Connelly. Graffiti-adorned city skate park. Photo by Erin Connelly. Globe Theatre. Photo by Erin Connelly. Beyond Tower Bridge there are some interesting Victorian buildings, but the bridge is a good ending point for what is likely to be half a day's journey. The intrepid walker may wish to cross the bridge back into the city, which will provide views of the Tower and St. Paul's Cathedral or there is a tube station not far from the bridge (Tower Hill station). Why? See most of London's landmarks and enjoy a walk along the Thames.